We are committed to the respect, protection and conservation of the environment and to the satisfaction of our consumers' needs in a sustainable manner. Through responsible operations, we demonstrate that the development of energy infrastructure can be compatible with the protection and preservation of the environment when it is done in a responsible manner. Minimizing and controlling the environmental impact of the operations and the services provided by our businesses. Ensuring the sustainable management of the resources by continuously improving and monitoring the operating processes and the environmental management. Optimizing and reporting environmental performance of consumption of water, fuels and energy based on the environmental objectives and goals that are confirmed yearly. Ensuring the compliance with the applicable environmental laws, regulations and standards, as well as with the best industry practices, the global corporate guidelines and the specific requirements stated in the different permits granted to IEnova's subsidiaries. Clean and efficient energy sources. Comprehensive waste and emissions management. Our business segments differ from each other; therefore, the way in which resources are managed and the actions taken to improve the environment is also different. However, we have a common denominator: a view of continuous improvement focused on environmental processes and Quality Management Systems. At IEnova, we have tools that enable us to identify and control the environmental impact, which in turn, allow us to continuously improve our environmental impacts. 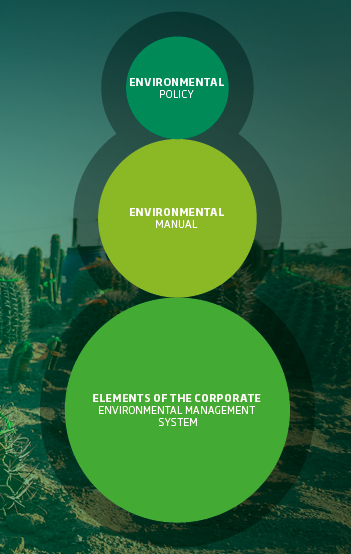 We operate on the basis of a series of environmental management systems that set the guidelines we need to follow during the development, construction, and operation stages of our assets. These systems comply with the parameters established by the ISO 14001:2004 environmental management standard. To learn more about our key performance indicators, we invite you to read the Environmental section of our 2017 Sustainability Report.